Select performance parts take the Mustang GT to greater heights. Updated December 30, 2017, to clarify the performance pack’s short-throw shifter. The 2015-2017 Mustang GT has since been replaced by an updated 2018 model with a fresh look at available 10-speed automatic transmission. I’ve driven nearly every Ford Performance enhanced product, with the exotic Ford GT supercar the lone exception. The overarching task of Ford’s performance division is to take ordinary or already sporty models and convert them into something extraordinary. Models like the Ford F-150 Raptor, Focus RS, Shelby GT 350/350R, Fiesta ST and Focus ST. Yet, the division’s influence extends far beyond these models to include Ford-authorized aftermarket parts, wheels, performance packs, superchargers and crate engines for tuners and weekend warriors. In other words, Ford Performance has something for everyone. 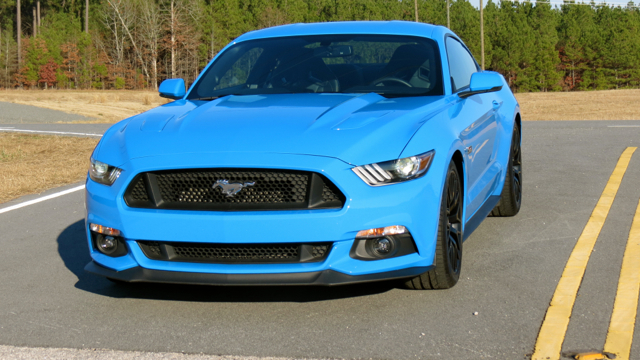 One such beneficiary of Ford Performance’s prowess is the Mustang GT. Shoppers may opt for the GT Performance Pack ($2,995), available with manual gearbox models only. The package extensively modifies the GT, making such changes as adding 19-inch Ebony Black-Painted Aluminum Wheels set within summer-only tires, Brembo six-piston brake calipers with larger rotors, heavy-duty front springs, a k-brace (for stabilizing the front suspension while cornering), strut-tower brace, unique chassis tuning, a larger rear sway bar, spoiler delete and a TORSEN differential with a 3.73 axle ratio. Inside, you’ll find a gauge pack, adding oil pressure and vacuum dials, as well as an aluminum-trimmed instrument panel. You’ll also find a nifty “tool” known as a short throw “no lift shift” transmission shifter. When operating under full throttle, this feature allows you to keep the gas pedal on the floor while shifting gears. At launch, rev the engine, drop the clutch, and hammer the throttle. Yes, those are summer tires on this Mustang GT. You’ll want to invest in a set of all-season or winter tires when temperatures drop below 45 degrees Fahrenheit. 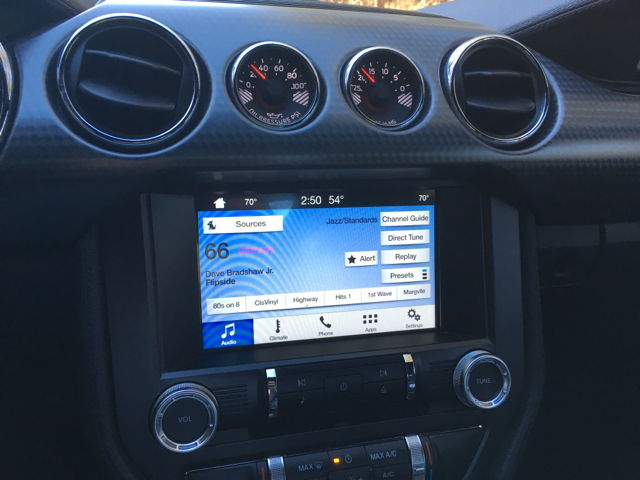 A 2017 Ford Mustang GT Premium equipped with the GT Performance Pack, Shaker Audio System Package ($1,795), Recaro Leather Trim Sport front seats ($1,595) and a reverse sensing system ($295) was my end-of-calendar-year visitor, carrying a retail price of ($44,775). 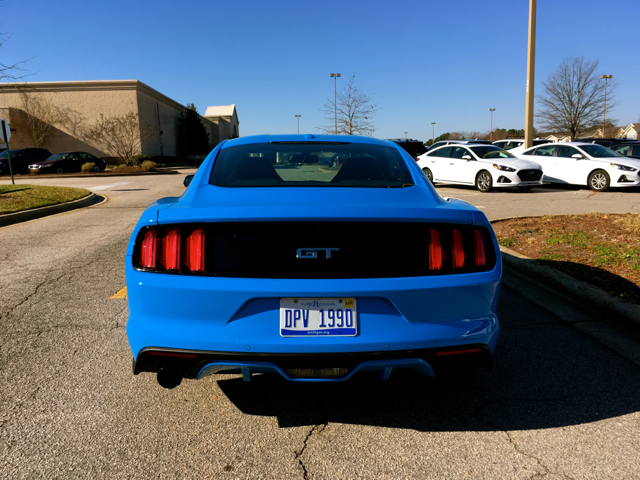 Although the refreshed 2018 model was on the market for a few months, I jumped at the chance to drive the 2017 Mustang GT. And who wouldn’t? 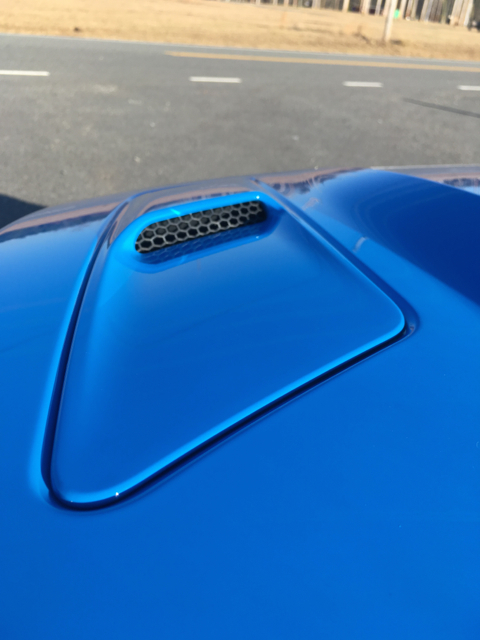 Securing performance versions of Ford products take time — even as the calendar year comes to an end, interest in such models remains. Incidentally, if you do happen to consider the 2018 model, this same performance package retails for $3,995. Further, it is now available with models equipped with the Mustang’s new 10-speed automatic transmission and adds a pair of items to justify its $1,000 premium: a larger radiator and a performance rear wing. 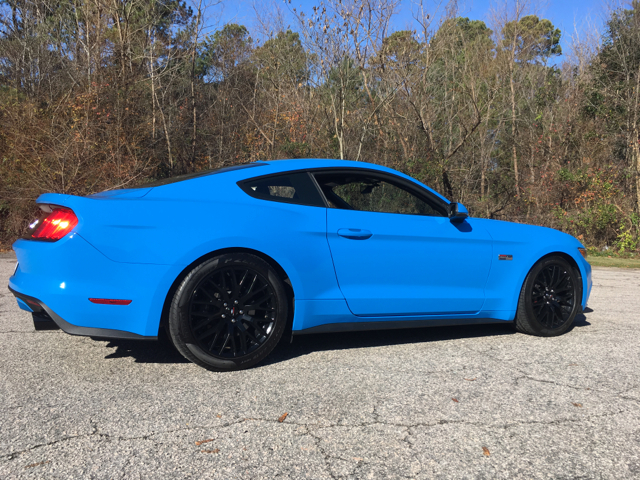 Ford Performance tweaks to the Mustang GT also yield power and handling benefits, especially when additional performance parts are part of the equation, including a cat-back exhaust system ($1,549), cold air intake and calibration power pack ($949) and a track handling package ($1,520), to name a few. When properly equipped, overall power increases from an already robust 435 horsepower and 400 pound-feet of torque to 451 horsepower and 424 pound-feet of torque. Importantly, you control that excitement by means of a smooth shifting six-speed manual gearbox. 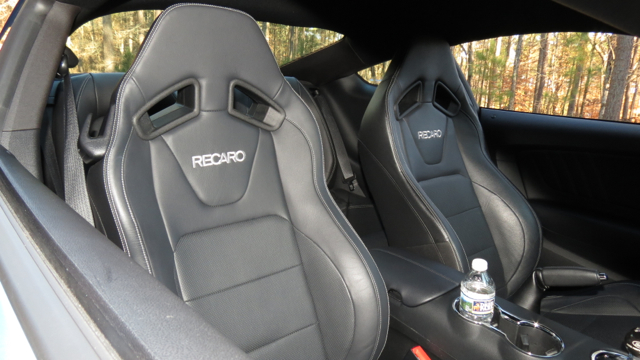 The available Recaro seats provide ample lateral and hip support. 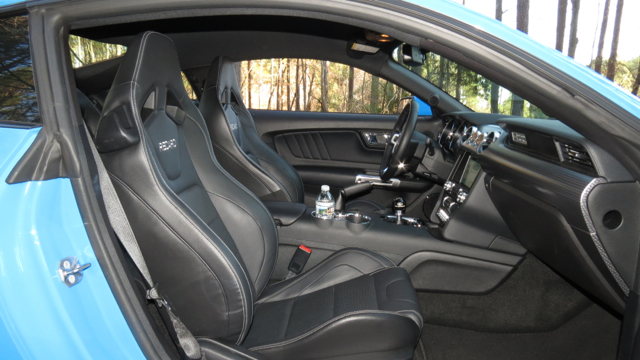 They were also more comfortable than the Recaros in the Shelby GT350. As for rear space, it is cramped. Seating is comfortable for two. Four can fit in a pinch. I received sufficient warning about the “slippery” rear tires when handed the keys to the GT, but it took a few turns around town and on the open road to gauge exactly what I was dealing with. Tires, of course, play a big role in handling. Up front, the Mustang GT has 255/40R19 tires; at the rear, you’ll find 275/40R tires. They’re summer tires too, and that means when temperatures drop below 45 degrees Fahrenheit they begin to lose traction. Ideally, summer tires are best for when ambient temperatures are warm or hot. That’s the ideal, although not always what’s practiced. Indeed, the tread rubber compound includes flexible plastic. When temperatures drop, the plastic becomes inflexible, increasing the likelihood of the compound breaking. Fortunately, December temperatures in central North Carolina were still relatively warm with daytime highs in the 50s and 60s common. To avoid drama, I chose the warm days for the bulk of my driving. On the remaining days, I didn’t venture out until the afternoon when cold wasn’t a consideration. The driver-focused cockpit is simple, yet sporty and even elegant. The GT Performance Package adds a pair of gauges for oil pressure and vacuum. Ka-boom! That’s precisely what I (and my neighbors) heard whenever I started the Mustang GT. However, unlike the Shelby GT 350, there isn’t a switch available to quiet that note. Not that you want to tone things down, but depending on where you park your ride, your neighbors may complain. This hot steed shifts cleanly with smooth clutch uptake. But the lack of grip from the rear tires means shifting into lower gears may result in tire spin or slippage, even with traction control engaged. More than once I found myself holding off shifting between first and second gear to avoid grip loss from the Pirelli P Zero tires. 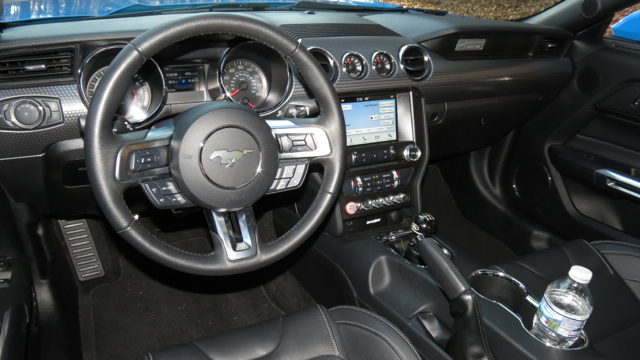 Everything else about the Mustang GT is solid, from the comfortable Recaro seats to the weighty steering. As much as possible, I kept the steed in sport mode, enjoying the solid feel of the steering wheel and the precision handling of every turn. For enthusiasts, a 4.3-second 0-to-60 mph time should be within range. Even better times are in store for the 2018s. 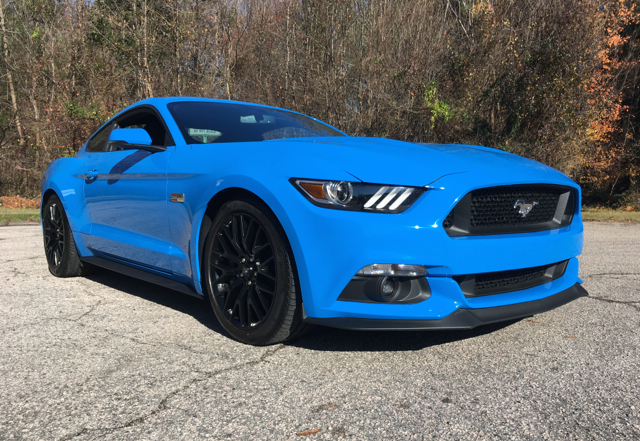 You’ll realize this Mustang’s sweet spot at high speeds, particularly as the coupe knuckles down when pressing hard on the pedal. Find your place in fourth or fifth gear and the V8 percolates, sending beautiful booms through the exhaust outlets as you ease up on the pedal. Sixth gear may seem like an afterthought…something to consider when maintaining an even highway speed with cruise control on. Another attribute of the Mustang is its big brakes. Slam them and you’ll come to a quick stop with zero brake fade noted. The cooler temperatures may have helped somewhat in mitigating heat build up for the week I had it, otherwise, I was very impressed by this steed’s poise from start to finish. 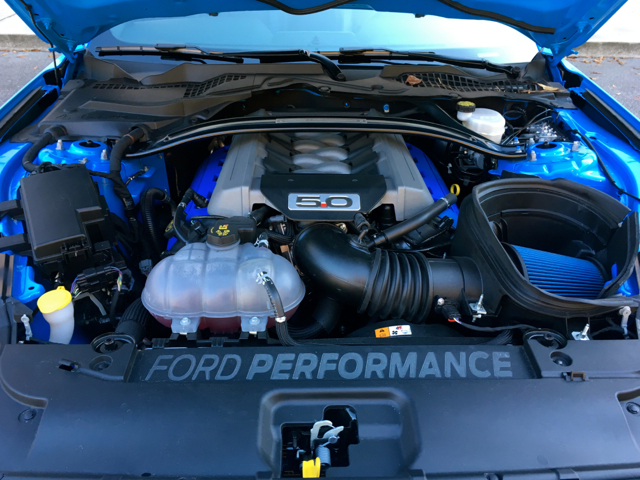 Ford Performance is “all over” this GT’s engine bay. This model is enhanced by several parts including strut tower brace and a cold air intake. The Mustang GT gives enthusiasts most of what they need in a powerful muscle car for under $40,000. That said, you’ll probably want to add at least the Performance Package and the Cold Air Intake and Calibration Package to achieve maximum power and control. Most models will cost somewhere around $45,000, with $50,000 the likely range if you insist on the enhanced audio system and a few other Ford Performance goodies. All in all, the 2017 Mustang GT hits all the high notes in the segment. Certainly, if performance is your be all and end all, opting for the 2018 model provides a fresh look with improved performance — a winning combo you won’t want to easily dismiss. Bright sunlight lightens the patina of the “Grabber Blue” model. The Mustang’s aggressive front fascia is amplified by the triple LED lights. 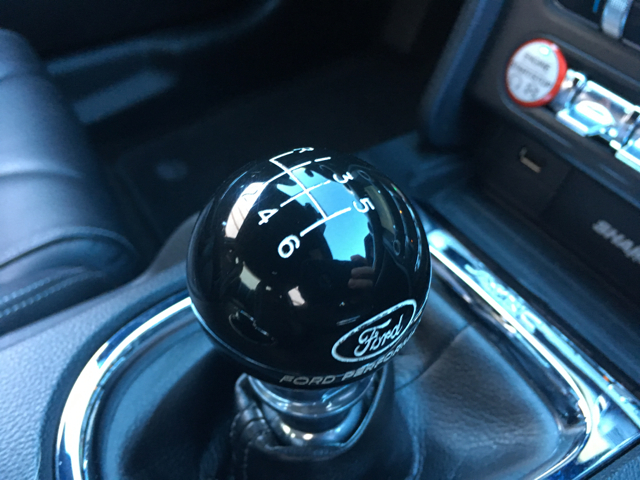 A special Ford Performance knob graces the gearbox shifter. This short-throw shifter makes it easy to dump the clutch at full throttle. 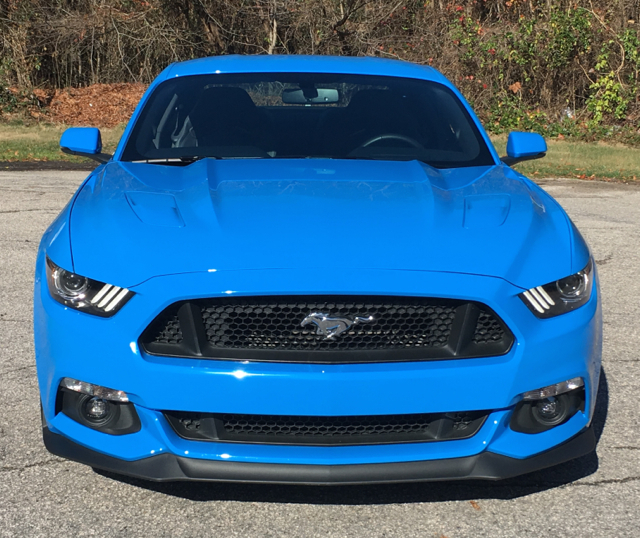 Twin hood scoops dress the 2017 Ford Mustang GT. The familiar sequential tail lamps dominate the Mustang’s rear fascia. OBD-II device: your solution for what ails your car. All cars built since 1996 are equipped with an industry standard on-board diagnostic system. That system is always at work in the background, but will immediately alert you to a potential problem by turning on the check engine light and keeping it on until your car is serviced. There is no need to panic: as long as the light is stable and not flashing, you can perform a diagnosis yourself. 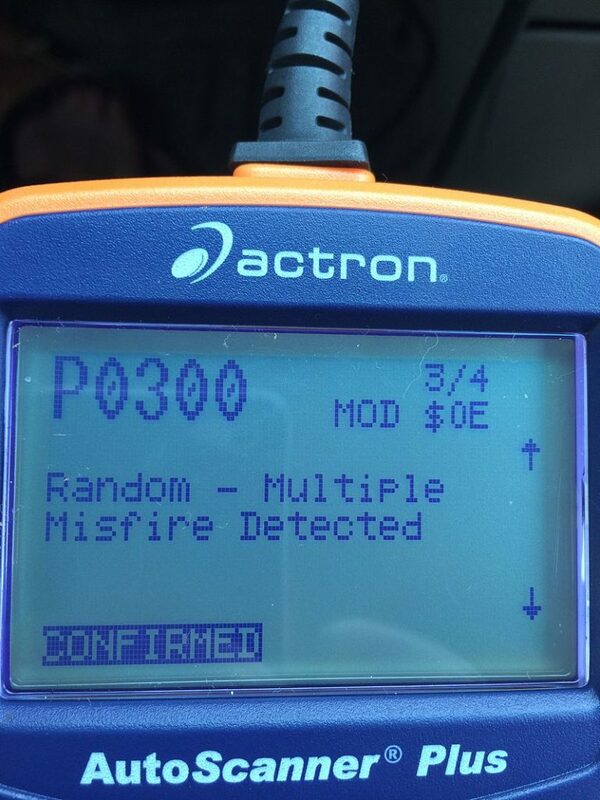 Purchase a diagnostic device. The current diagnostic system, also known as OBD-II, provides easy read out information to help you determine what is wrong with your car. Handheld diagnostic devices cost about $80 — what you would pay a mechanic for a diagnosis — and are available through your auto parts store. Choose one that is not specific to a vehicle brand, a device that can read and interpret data from any modern vehicle. See: Kicking Tires: What Does the Check-Engine Light Mean? That port is usually located under the lower dashboard on the driver’s side. Your owner’s manual will also list its location. The screen of the reader will list a code, typically a letter followed by four numbers. For example, P0549. Certain code readers explain what the problem is by listing that information along with the code. Other readers provide a list of codes in a book that is included with the code reader. If the code is not listed in the book, it might be specific to your make only. Contact your vehicle’s service department for a diagnosis. If the code suggests a problem that you can handle yourself such as a loose sensor, you can make the repair and attempt to clear the code from the OBD-II system. Your code reader may also come equipped with a reset button that will clear the code. If no reset button is available you can remove and reinstall the battery terminal in the reader. Then, restart your car and observe whether the code has cleared. If it has, then you have avoided a shop visit. If it hasn’t cleared, then contact your mechanic. An OBD-II reader can pay for itself after just one use. You may prefer to see your mechanic anyway with the information obtained at least alerting you to the repair that must be made. Never ignore a check engine on light as whatever problem you have can worsen and cost you more money in repairs.